Camarillo, CA – Exploding onto the scene as a band determined only to expand the boundaries of popular music, Blood, Sweat & Tears immediately made their mark as virtuoso players with an important vision and statement. Calling on Rock, R&B, Jazz and even Classical influences, the band, led by Al Kooper, made what remains one of the truly inspired, groundbreaking records of the late ’60s. 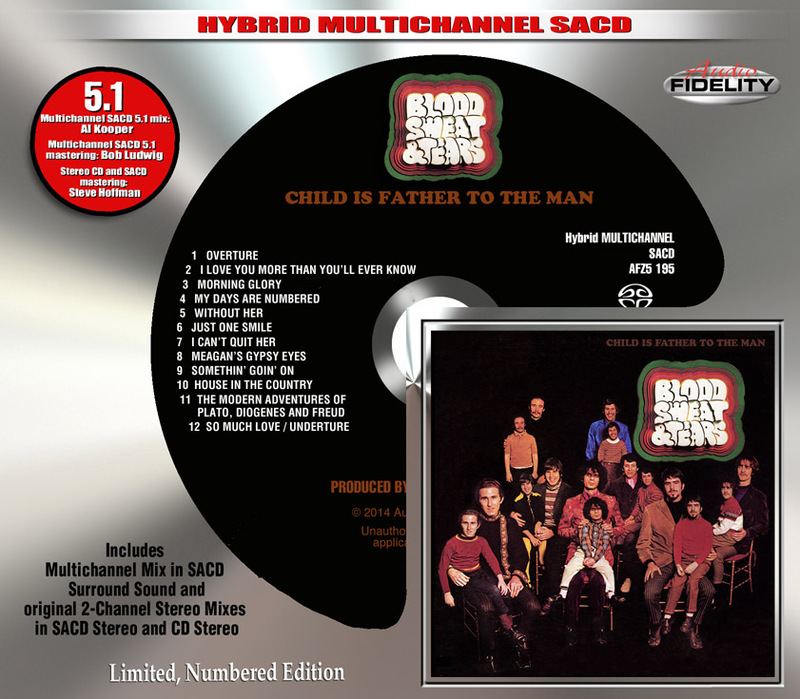 Now much to the excitement of BS&T and Al Kooper fans worldwide, Marshall Blonstein’s Audio Fidelity is reissuing the band’s critically acclaimed debut album ‘Child Is Father To The Man’ on 5.1 Multichannel Hybrid SACD! The album, released in 1968, introduced the idea of the big band to rock and roll and paved the way for such groups as Chicago. ‘Child Is Father To The Man’ peaked at #47 on Billboard’s chart. “I Love You More Than You’ll Ever Know” and “I Can’t Quit Her” generated airplay on progressive rock radio. This is the sound of a group of virtuosos enjoying itself in the newly open possibilities of pop music… the eclectic post-Sgt. Pepper era, a time when you could borrow styles from Greenwich Village contemporary folk to San Francisco acid rock and mix them into what seemed to have the potential to become a new American musical form. Kooper is also excited about the re-release of the classic ‘Super Session’ album featuring Al Kooper-Mike Bloomfield-Stephen Stills. The album is re-mastered with the latest (Hybrid Multichannel SACD) technology. The package includes new liner notes written by Al Kooper that tells the story of the Super Session album and the new 5.1 Multichannel mix. The 5.1 mix by Al Kooper with mastering by Bob Ludwig was never released and yet it has acquired some fame from industry insiders familiar with the Multichannel mix with comments like “excellent” and “it deserves to be heard.”The new mastering of the Stereo tracks for new SACD Stereo and CD Stereo audio are by mastering engineer Steve Hoffman. -The official release of ‘Super Session’ on amazon.com is -September 9th. In 1960, Kooper joined the songwriting team of Bob Brass and Irwin Levine and wrote “This Diamond Ring” (#1 U.S. Hit in 1965) for Gary Lewis & the Playboys. At 21, Kooper moved to Greenwich Village and began a momentous relationship with Bob Dylan. He performed and recorded with Dylan including adding his classic Hammond organ riffs on “Like a Rolling Stone” (#2 U.S. Billboard Hot 100 Hit in 1965). During those recording sessions, Kooper met Michael Bloomfield. For the rest of the bio and the interview, please visit the Music Tried and True website! 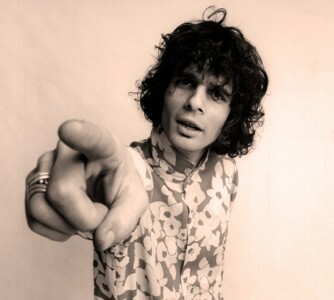 HOLLYWOOD (Herald de Paris) – In a career that spans fifty years, Al Kooper has managed to turn up at key points in the last five decades. He is often referred to as the “Zelig” or “Forrest Gump” of rock. 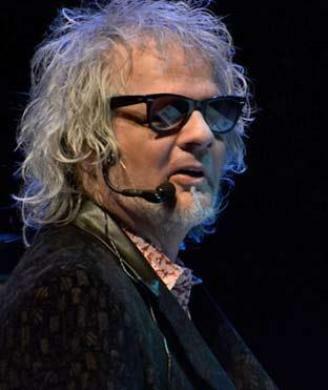 Herald De Paris had the opportunity to speak the man, the myth, the legend, Al Kooper. Kooper started out as a guitar player but quickly became known as a keyboard player, as Al explains, “Because I played the organ on ‘Like a Rolling Stone’”. He is well known for his organ playing on Bob Dylan’s “Like A Rolling Stone.” He played off and on with Dylan for many years, both live and in the studio. In 1958 Kooper began his professional career as guitarist in The Royal Teens (“Short Shorts”). He reinvented himself into a Tin Pan Alley songwriter with cuts such as “This Diamond Ring” by Gary Lewis and the Playboys. He also went on to write for artists such as Gene Pitney, Keely Smith, Carmen MacRae, Pat Boone, Freddie Cannon, Lulu, Lorraine Ellison, Donnie Hathaway and was later sampled by The Beastie Boys, Jay-Z, The Pharcyde, and Alchemist to name but a few. In the mid-sixties Al was a member of The Blues Project and then founded Blood Sweat & Tears, remaining only for their debut album Child Is Father to the Man. For the rest of the interview, please visit the Herald de Paris website!